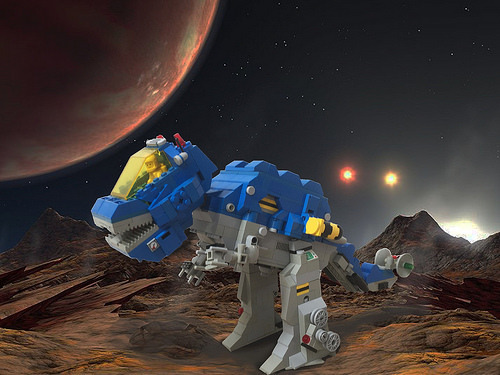 Following on from Clinton’s recent post on the Mecha-Dinosaur, here’s some more Classic Space Dinosaur goodness in the form of David Alexander Smith‘s latest creation. 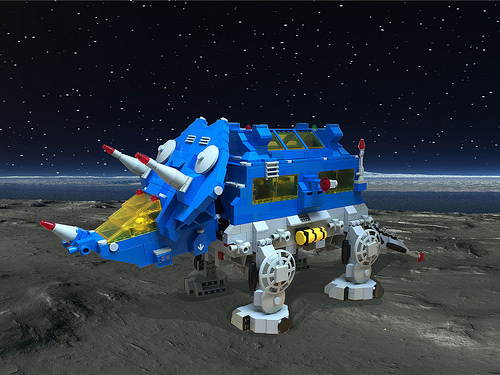 The SpaceOSaurus-REX nails the nostalgic look with its spot-on color scheme and detailing. I’m loving the trans-yellow canopy and the radar antenna tail in particular. This impressive beastie is just the latest in David’s series of space dinosaurs. I’d recommend you check out this excellent TrispaceOTops, along with a rather fetching SpaceODactyl. It’s great when one of the classic LEGO themes is treated like this – inspiration rather than a slavish ruleset to follow. I really enjoy seeing the immediately identifiable and evocative Classic Space colors applied to imaginative creations beyond spaceships and moonbases. I cannot wait to see these models “in the brick” at BRICK2015 in London later this week.